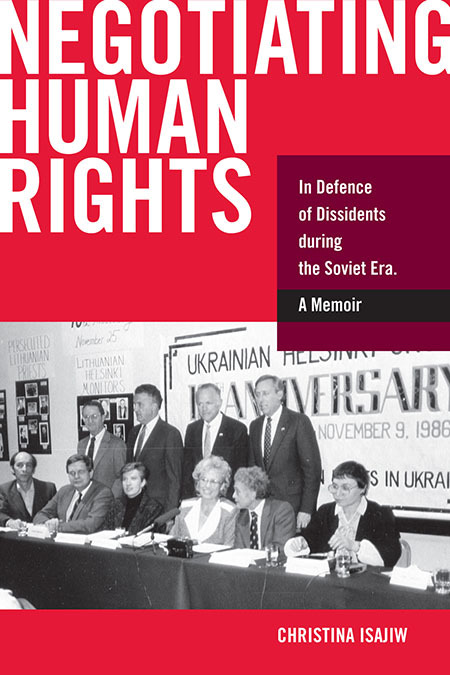 30 October 2014— The new CIUS Press publication, Negotiating Human Rights: In Defence of Dissidents during the Soviet Era: A Memoir by Christina Isajiw with a foreword by Bohdan Nahaylo, is one of the first insider’s accounts of the efforts during the 1970s and 1980s on the part of Western Nongovernmental Organizations (NGOs) and their workers to bring aid and support to Ukrainian dissidents and activists. With passion and a novel perspective, Ms. Isajiw uses her first-hand experience working in defense of human rights in the years following the Helsinki Accords to shed light on a tumultuous period of Ukrainian history. promotion of human rights through Western commitment and political activism, while allowing a rare glimpse of Ukraine on the eve of the Soviet Union’s dissolution. those who fought for human rights, democracy, and national identity. lobbying in defense of dissidents and human rights activists in the former USSR. A leader in the Ukrainian-Canadian community, Ms. Isajiw has lent her voice and memories to various publications and panels on the subject of political activism and non-conformism within the Ukrainian context. This book can be purchased from the CIUS Press for $34.95 (paperback and CD). Outside of Canada, prices are in USD. of Alberta, Edmonton, AB, T6G 2H8, Canada.